As an Irish/Celtic fiddler, Tom has made multiple trips to Ireland to perform and research the music of County Clare and western Ireland. Along the way, he’s studied with and played alongside legendary musicians including Tommy Peoples, Manus McGuire, Seamus McGuire, John Whelan, Kevin Burke, Liz Carroll, Thomas Walsh (composer of Inisheer) and Robin Bullock. In 2012 Tom wrote and published his own method book, Learn to Play Irish Trad Fiddle. The book has received very positive reviews in Fiddler magazine & Irish Music magazine and is distributed by SHAR Products. In 2013 he took a group of his adult fiddle students (the ‘Fairhope Irish Trad Explorers’) on a performing tour across Ireland. The amateur ensemble performed at community centers, ancient churches, convents & pubs. His band Mithril is one of the premiere Celtic/World music groups on the Gulf Coast and has performed on concert series and with symphony orchestras in Alabama, Mississippi, Georgia, Florida, Michigan, Indiana, Missouri, Oklahoma, Texas, California, Illinois, Tennessee, and Pennsylvania. With six CDs in release, Mithril has been featured on a number of syndicated radio programs, including Celtic Connections and Prairie Ceilidh, heard across the US and Canada, as well as on AOL World Radio and XM Satellite Radio. His Irish Trad duo project Banna de dhá (with Charleston, SC-based guitarist & vocalist Hazel Ketchum) released their first CD ‘Band of Two’ in 2013. The album has received airplay on numerous Celtic music radio programs and podcasts, also reaching #1 on celticradio.net‘s Top Ten Request chart for the month of May 2014. The pair have performed at Celtic music festivals, Scottish Games and concert series around the southeast U.S., and opened for top Irish bands including We Banjo 3 and Solas. As a jazz violinist, Tom recorded and toured with New Orleans clarinetist Tim Laughlin, including two European tours with Tim’s New Orleans Jazz All-Stars. Tom’s playing on the albums ‘Talkin’ Swing’ (recorded with Laughlin) and his own ‘Major & Minor Swing’ earned great reviews in national publications, including JazzTimes and Fiddler Magazine. As a member of ‘new traditionalist’ country artist John Anderson’s band in the 1980s, he earned a gold album for his contributions on ‘Wild and Blue,’ which broke new ground in the country-crossover genre. He toured with Anderson for five years and played on several of his classic Warner Bros. albums (all recently re-released). 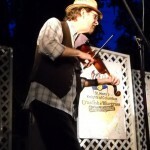 Besides his work as a performer, Tom currently teaches privately, is in demand as a lecturer on the History of American Fiddling for the University of South Alabama’s Road Scholar program, and has appeared as a guest performer/clinician at several area colleges, string camps, and his own successful Irish Fiddle workshops and Slow Sessions. He teaches as a faculty member for several string camps, including O’Connor Method Camp Charleston, Fiddle Hell Massachusetts, and SCOR! Adult String Camps. Tom is a certified Mark O’Connor Violin Method teacher.